In November 2012, some 90 representatives of civil society organisations met in Bangkok for a series of meetings organised by the International Budget Partnership (IBP)*. CIAP provided interpretation in English, French, Spanish and Russian for participants from Africa, Latin America and Central Asia. “CIAP is truly a one-stop shop”, says Trisha Viecco, Events Coordinator at IBP in Washington DC. This meeting has proved relatively easy to organise, partly because CIAP was taking the lead on organizing the interpreting side and making sure we had the interpreters and equipment we would need to cover five days of meetings with so many languages. CIAP was able to identify potential issues with the format of our agenda and worked with us and the equipment provider to ensure the smoothest transitions between sessions. The team of English, French, Russian, Spanish & Indonesian interpreters in BangkokCIAP had previously organised the English, French and Spanish interpretation for IBP’s 3rd Partnership Initiative meeting in Siem Reap, Cambodia, in June 2010. When the 2011 edition left Asia for Tanzania, no consultant interpreter was hired, as clients are often unaware that CIAP can organise teams on all continents thanks to our links with consultant interpreters and AIIC members around the world. After a difficult experience in 2011, where both interpreting and equipment issues made communication challenging at times, IBP was keen to guarantee a quality service for the Bangkok meeting and once again reached out to a CIAP associate. IBP originally contacted CIAP for Spanish and French interpreters for this meeting. When the client later realised that some Russian speakers would also attend, we were able to add a Russian team. When the finalised agenda arrived shortly before the meeting, it contained numerous breakout sessions with participants moving to different meeting rooms. As CIAP’s consultant interpreter, I was able to immediately highlight the implications for simultaneous interpreting and recommend solutions, including portable equipment and grouping participants by language as much as possible. In the early stages of organising the event, Trisha Viecco also consulted CIAP on her choice of equipment provider. Since Bangkok is a popular conference destination where CIAP has always had a strong presence, the fact that we had never heard of the supplier recommended by the venue hotel raised a red flag. Trisha opted for CIAP’s supplier of choice in Thailand, Convention Organisers Co., Ltd., whose quality equipment and reactive technicians also helped produce a seamless event and respond to last minute agenda changes. Quality doesn’t cost: it pays. Communication between the client and the consultant interpreter is key in the earliest possible phases of organising an event. Transparency and participation between all stakeholders are effective tools, not just for fair public budgets but also for working successfully with the professional interpreters servicing an international meeting! * The IBP’s Partnership Initiative (PI) supports over 35 civil society organizations working on analyzing and monitoring government budgets to boost positive outcomes for poor communities in their countries. 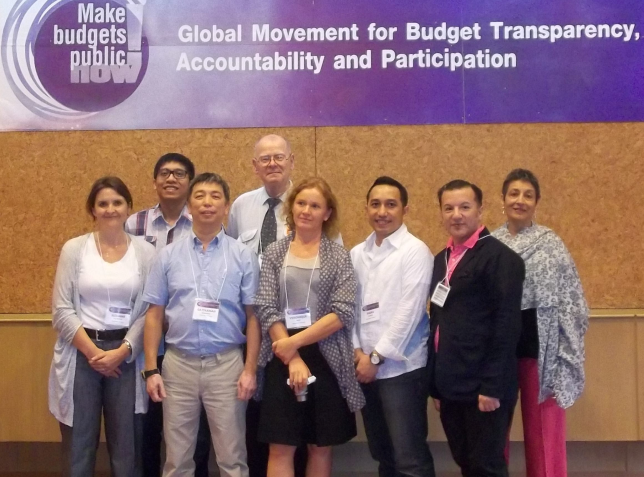 IBP is also behind the Global Movement for Budget Transparency, Accountability and Participation (BTAP), which also met in Bangkok.